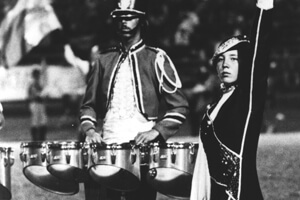 The 1981 Drum Corps International World Championship, the very first ever to be held outside of the United States at Montreal's Olympic Stadium, was to be the seventh year that PBS stations broadcasted the Championship. As the network was not structured to broadcast from outside the U.S., instead, it became the first and only year that PBS recorded the DCI Midwest Regional from Whitewater, Wis. Consequently, the official DCI videos from 1981 are from the August 8 Whitewater show, while the official audio recordings are from the August 22 World Championships in Montreal. Blue Devils took second at both Finals shows, under Madison Scouts in Whitewater and Santa Clara Vanguard in Montreal. Despite losing to SCV at the World Championships, the corps had beaten its Bay Area rivals in all nine meetings up through the Finals in Whitewater, and also won the Whitewater Prelims. Visually, BD's 1981 show started with the horn line in a company front against the front of the field, walloping the audience with the fanfare to DCI Hall of Fame arranger Wayne Downey's "New York Fantasy," which was how the corps also opened up its 1980 show. The fanfare was part of a larger work Downey wrote that only saw the light of day in his marching band arrangement for "State of the Art," his series for Jenson Music Publishing. Also brought back from the corps' Championship season of 1980 was "Ya Gotta Try," written by Sammy Nestico, a famed jazz arranger and composer for some of the most successful big bands ever, including the Count Basie Orchestra. In the accompanying video clip, you can see how the color guard for the first time adopted a sleek streamlined costume that allowed for easier execution of dance moves, leaving behind the traditional long skirts it wore through 1980. The percussion feature of this production was "La Danse du Bonheur," from Shakti's 1976 album, "A Handful of Beauty." Shakti grew out of the second incarnation of the Mahavishnu Orchestra, utilizing a heavy dollop of ethnic Indian percussion combined with jazz, which opened the door to what became known as World Fusion. The drums re-created the Indian percussion lines while the mallets played the violin part from the original. During this feature, the brass players picked up a series of five-yard long purple banners stretched between two members, while the rifles had long silver metallic streamers on sticks that picked up on the silver in the silver and blue flags. Performance excerpt of the 1981 Blue Devils. Discount DVD offer ends Monday, May 28 at 8:30 a.m. ET.